Having found an image of this book in the list of photos of book covers in my file of pics for this blog, I've clearly planned to write about this book for some time - it just hasn't happened. Until now! Marge Piercy is one of my favourite writers. She's known as a feminist writer and the books reflect that. That there is also a strong Jewish flavour and, often, theme to her books is another attraction for me. 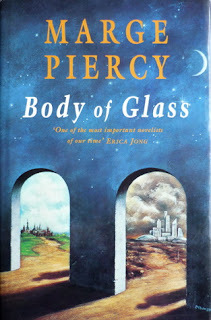 Body of Glass, also published as He, She and It, is one of two books that use time slip structures, in this case, a post apocalyptic time in the future, and 16th century Prague. The other, which I must re-read - and write about - Woman on the Edge of Time, switches between current time and the future. The rest of Piercy's fiction deals with women's politics, historically and at the time of writing. Body of Glass runs two story lines. In the future time, set in east coast America, everyone is on the Net, but not everyone is equal. Society is divided into those in the corporate multis (educated, financially comfortable, but ruled by the culture and hierarchies of their particular multi, down to things like clothes and hair styles), the free towns (independent of the multi structures, but always at risk of being taken over for the products they create) and the rest, who populate 'the glop' - a dangerous and unpredictable environment along the east cost, largely underground due to UV radiation dangers. Most food is vat-produced from various algae, as arable land is now scarce and 'real' food is a luxury. The entire population has access to the Net and online espionage is a real threat to the free towns. Artificial intelligence is a feature of every day living, with smart houses that interact with their inhabitants, programmable vehicles, and robots for various menial jobs. Artificial organs are the norm when people's own fail, so there is a black market for real organs and pirates that prey on people to 'harvest' them for sale. Shira Shipman, the central character, is a mid level tech in a multi. When she loses custody of her son after her divorce, she returns to her home town - the free town of Tikva, known for the quality of its online security systems. She is offered work with Avram, father of the boy she once loved and never got over. Avram's project is a clandestine and illegal one - the creation of a cyborg that can help protect Tivka online and in real space. It's his life work, and he has collaborated with Shira's grandmother, Malkah, on the latest version, which has resulted in his first viable cyborg, Yod. Shira's job is to socialise Yod. Shira is torn between being fascinated by her work, and trying to work out ways to retrieve her son. As it becomes apparent that Tivka is under siege from the multis, her work with Yod becomes critical, and her mother - who handed her over to Malkah as a baby and is a mysterious character who is also being hunted by the multis - appears, which creates a new lot of tensions, and also a way to go after Ari, her son. The other story line centres around the chief rabbi of Prague in the 1500s, Rabbi Judah Loew, also known as The Maharal. He was a real man, known as a Talmudic sage and secular scholar, but also as a famous Kabbalist, and legend has it that he created a golem. It was a time of rising anti semitism, and the Jews of Prague - confined to a ghetto - were at constant risk of attacks. The Maharal takes two of his fellow scholars out of the ghetto in the dead of night to create the golem, Joseph, which he has to teach how to act so as to pass him off as a real man, so as to allow him access to the whole of the ghetto precinct, as well as the wider town, in order to listen and watch, and hopefully prevent attacks. In the future time, Malkah tells Yod the story of Joseph, equating the cyborg with his 16th century Kabbalistic counterpart. The links between the past and future times can get quite thought provoking, and I find myself looking for equivalents in our own times - the questions we are all asking now as the pace of technology outpaces our understanding of many of the ethical issues that can arise. In Yod's time, there has long been a prohibition of creating artificial life to the level Avram achieves with Yod - an individual who is part robot and part sentient being with wants and needs of his own. Yet, he has been created with one basic idea in mind - he is a weapon, created to protect Tivka and its people from the multis...as Joseph, the man of clay was created to protect the people of the Prague ghetto. Both are under control of their masters - Avram and The Maharal - who have the ability to destroy them should they step out of line. Yod achieves far more autonomy than Joseph ever does - in the progressive environment of Tivka, he is 'outed' for what he is, and the town is prepared to consider his case for independent living and status. However, time is running short and the risks from the multis is growing. It becomes clear, the more Yod and the others penetrate the inner workings of the multis, that the upper echelons of those communities know about Yod and what he is, and they want him. They are prepared to go to great lengths to get him, and Avram's files. To what level must the citizens of Tikva be prepared to go, and how can Yod help them achieve lasting freedom? There are FAR more complexities to this book than the outline I've given here. There are stories within stories and it's a great big read! Piercy's ability to hold together a highly complicated story that operates on many levels is impressive, and I continue to find myself gripped by this book regardless of the number of times I've read it. I don't think it's in print any more, and I have no idea if it's available for e-readers. I did spot a few secondhand copies on both eBay and Amazon at a range of prices. Well worth seeking out.